Today I successfully submitted a proposal to the National Science Foundation for The Elements Unearthed project. It was actually sent in via their online FastLane system, which I’ve dealt with before, usually with frustration and panic as I try to submit right at 5:00 p.m. on the deadline day. I broke with long habit and actually got this submitted a day early and it was a much more pleasant experience this time. Once that has all been worked out, you’re ready to actually start writing up a proposal. First, a preliminary proposal must be submitted and approved by NSF before the final proposal can be submitted. This I did on June 25, and of the 610 submissions, about 40% (approximately 240) were approved for final submission. Next, you must follow what the solicitation asks for in particular and what the General Proposal Guidelines say in general. This proposal needs an electronic cover sheet, a one-page project summary, a 15 page narrative description with bibliography, biographical sketches of the principle personnel, and a detailed budget with justification. In the past I tried to cut and paste text from a Word document; this time I converted all my files to .pdfs and merely linked them in, which was much easier. I also included diagrams and tables for the first time. 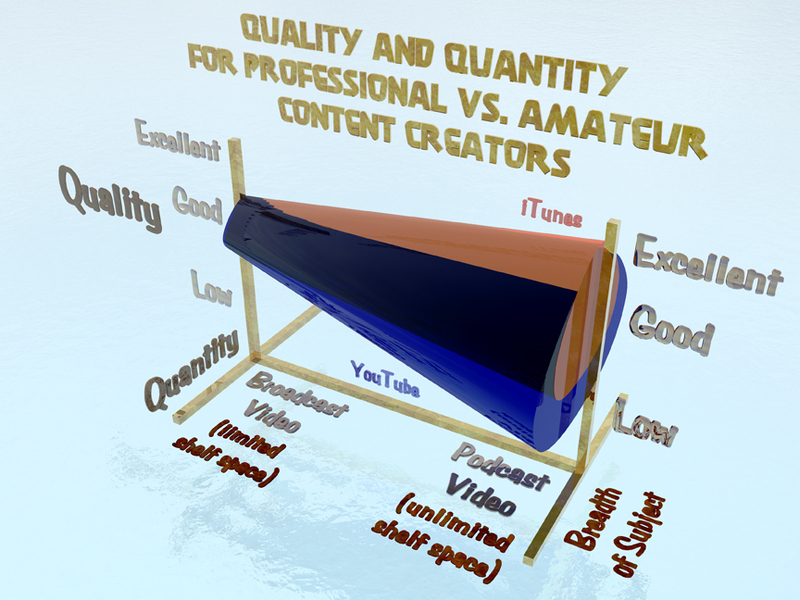 Here is a diagram I created this week showing the relationships between quality and quantity of videos created as one moves from professional broadcast video to podcasting. An obvious questions is, if I’ve had experience with this before, why didn’t I get the grant then and why do I think I’ll be successful this time? One of the best features of the NSF proposal process is that your projects are reviewed by at least three qualified experts who write up comments and suggestions. After doing the Letter of Intent (which is now a Preliminary Proposal – the solicitation was updated this year) and submitting the final proposal last year, the reviewers turned down my request mostly because I needed a better evaluation plan and broader project management. The basic idea was considered excellent and they all encouraged me to re-submit after improving those areas. I’ve now done so, at least as far as I can at this point (I’m still working out partnerships and the Advisory Committee) and my evaluation plan is much stronger than before. I would appreciate any comments you might make or any support you might be able to give. This file also lists the expected completion dates of future podcast episodes. Of the 240 or so that will submit final proposals, NSF expects to fund between 40 and 50 proposals. Mine is a Pathways Project, meaning it is a prototype project meant to eventually become a full-scale project. I proposed that we begin with 20 teams over two years, starting in 2010-11 with seven teams/sites in Utah, then spreading to 13 teams the next year in Utah, Colorado, and Nevada. I also proposed that each team work directly with personnel from local museums to utilize the museum’s expertise and to enhance the museum’s programs by providing finished video segments that can be used to attract visitors or for exhibits or even to sell in the gift shop to raise money. If you do the final math, 50 accepted out of 240 proposals is about a one in six chance. I’ve been successful with lower odds than that, so we’ll just have to wait and see. Unfortunately, the wait will be pretty long; it could be May before I know anything. In the meantime, I’m looking for other grants and sources of funding for this project, especially since I need money now to continue editing the videos and to set up new sites for this year. But that’s one big load off my chest – for good or ill, I’ve clicked the submit button and it’s out of my hands. Now I can get back to editing. I proposed to have some episodes (about nine) completed by Jan. 1, when I will finally officially launch the iTunes site for this project. I am also looking at hosting the videos on Ourmedia or Libsyn since I won’t be able to use this blog for much video storage and traffic. I’ll also create YouTube versions of each episode, although I will have to break them up into <10 minute segments as I have already done with the Project Rationale video. After the initial nine episodes on Jan. 1, I will post additional episodes as I can get them finished on the first day of each month through May or June. I have enough materials to do about 30 episodes all told by then, so about five per month. That’s a lot of editing, and I’m also trying to make money from my other endeavors to keep food on the table and the mortgage paid. If I can get some grant money, I can focus on this project along. We all have things we would do if we could because they are our passion. If we are extremely lucky, our passions also can become our careers and our jobs. If not, we have to work on them in-between trying to make ends meet. I’ve been luckier in this respect than most with past projects, and I know that I’ll be successful in this effort as well. Now that I’m healthy again (hooray!) 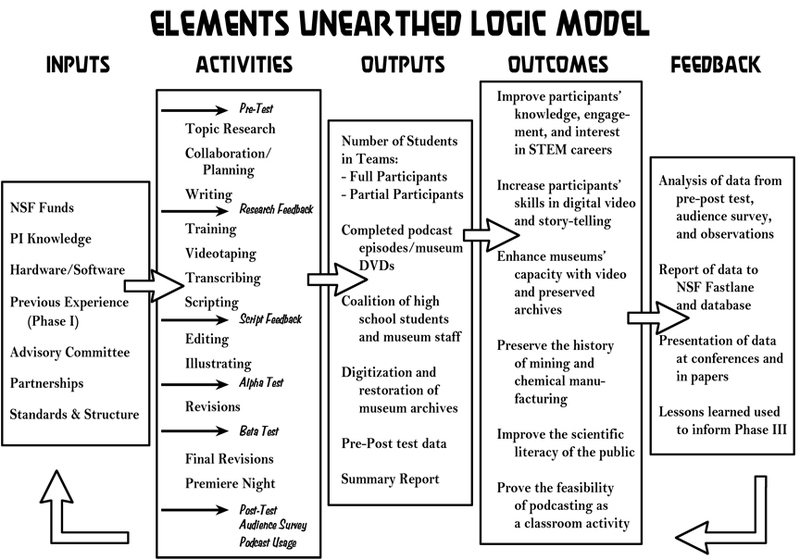 I’m back at work on The Elements Unearthed project preparing to write up a major grant application for the National Science Foundation for their Informal Science Education program. The due date for the application, which must be submitted electronically through their FastLane system, is Nov. 19 but my goal is to have it all done by Saturday the 14th. I had applied for this same solicitation last year and was declined. The reviewers all said that the idea behind this project is worthy and that I should re-apply, but that there were a few weaknesses to my proposal that need to be addressed. One was that my evaluation/assessment plan at the end needed to be better defined and thought through, and another was that I am basically the only administrator of the project. What would to happen to the project if I were to become ill or unable to finish it? My recent bout of kidney stone/influenza had me down for about 3 1/2 weeks, and it’s served to underscore the need to set up strategic partnerships and to share decision-making with others on this project. To that end, I am working to not only set up several additional site visits/projects for this year but to partner these projects with local museums. I am also working to create an Advisory Board consisting of science educators (for content appropriateness), industry leaders (including mining and environmental groups), and marketing/distribution organizations. I won’t say yet who I am trying to get on board, but things are moving forward and by the time I submit the grant application I’ll have worked out several partnerships. I also hope to have at least the beginning of the Elements Unearthed Podcast set up on iTunes so that the grant reviewers can see examples and because it’s high time we got it up and running. I keep promising it will be soon, but doing the final editing on the MATC student videos is very detailed and time consuming work. 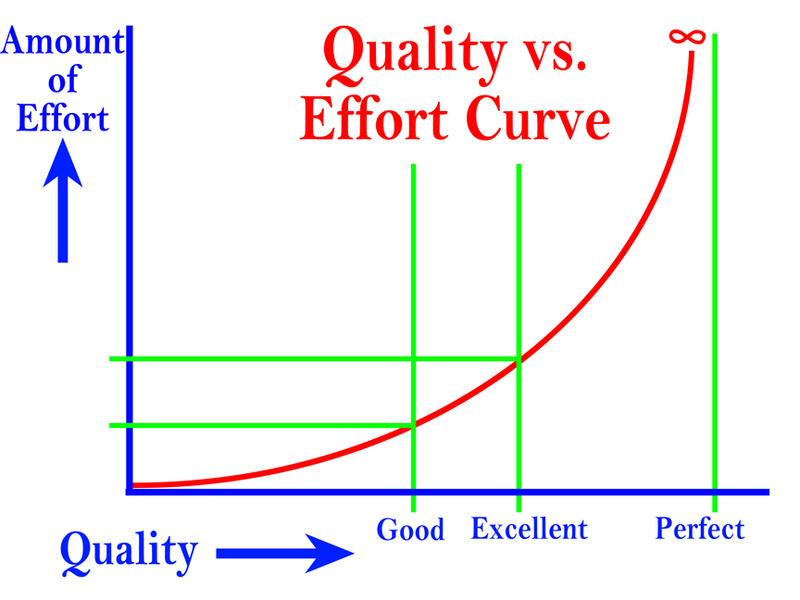 I always told my students that the relationship between effort and quality on any project isn’t linear (if you work twice as long you get twice the quality). It’s actually an exponential (or even hyperbolic) curve. In the diagram shown here, most high school students are satisfied with producing a work that is of good quality. After all, that’s what their teachers usually expect for a grade. They are rarely asked to produce a work of excellent quality (which is expected in the professional world). One might think that it only takes a little bit more work to turn a good project into an excellent project, but as the quality level increases, the amount of time and effort becomes steeper. It takes at least as much effort to go from good to excellent as it does to go from start to good, or in other words, if it takes two months to produce a good project, it will take four months to produce an excellent project. Which is why I chronically underestimate the amount of time it takes to complete a project. Sometimes students (and adults) get the idea that a project has to be perfect before it is released to the public or declared “done” (I suffer from this perfectionistic attitude all too much myself). Looking at the chart, you can see that the curve becomes infinitely steep as one approaches perfection – in other words, perfection takes an infinite amount of effort and can never be reached. Practically, it means that one can tweak and modify a project forever and still find things that aren’t quite right. The answer is somewhere between good and perfect. To be competitive and to stand out above all the other podcasts out there, our episodes must be excellent. Good isn’t good enough. But eventually I’ll have to let go, say the episodes are finished (though not perfect) and simply send them out to the public. They’re not there yet, but they soon will be (tweak, tweak). I want to have at least three episodes ready before setting up the podcast site at iTunes, simply because I don’t want people to write this off as one of those single-episode podcasts that are all too frequent on iTunes. My goal is that this will be one of the premiere podcast sites for chemistry education, with eventually over 100 episodes about five years from now (and over 20 by May, 2010). In the meantime, I have prepared a final video of an episode I created last year to explain this project and its rationale. I have already uploaded the video in two parts to YouTube (just search for “Elements Unearthed” and I’m sure you’ll find them, but here are the links: Part A: http://www.youtube.com/watch?v=YA_lwqDm-TI and Part B: http://www.youtube.com/watch?v=5jOyJosYVOE). I am attaching the two parts here for you to look at as well. They explain more what the project is, why we are doing it (our four major reasons and objectives), and give theoretical and philosophical justifications. I have created a series of animations and have many quotes from experts and recent studies about why projects like this one are essential for keeping the U. S. at the forefront of STEM education, and why utilizing citizen scientists and historians can open up the quantity and quality of science done in this country, and why using student teams is critical for this project from the perspective of educational theory. Please watch them and make comments back. I have set up a new e-mail address specifically for this project. It is: elementsunearthed@gmail.com. I hope to hear from you soon.